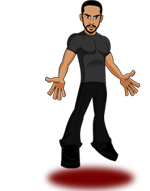 Today, when you order "David Blaine - Decade of Magic - DVD", you'll instantly be emailed a Penguin Magic gift certificate. You can spend it on anything you like at Penguin, just like cash. Just complete your order as normal, and within seconds you'll get an email with your gift certificate. NOTE: This is a Region 1 DVD and will only play on DVD players of that region. It will play on computers with a DVD drive and appropriate software. 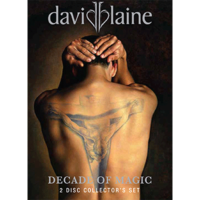 Decade of Magic picks up where Blaine's last DVD--Fearless--left off, collecting all the TV specials from 2002 forward. It also features some cool bonus footage. VERTIGO - Blaine's 2002 special featuring the pillar and high-jump stunt, as well as some of his trademark unique cutting-edge magic. This is my personal favorite of Blaine's stunts as I think it had the most emotional resonance. DROWNED ALIVE - Blaine's 2006 stunt where he was submerged in a giant fishbowl, and ended it with an attempt to break the world record for breath holding. Lots of good magic on this special, a cut above Vertigo. WHAT IS MAGIC? - This is the Dive of Death special that initially aired in 2008 re-edited to focus more on the magic and the bullet catch stunt that was a part of that initial special. This was one of Blaine's best I think, right up there with Street Magic and Magic Man (both which can be found on his first DVD release, Fearless). TED TALK - Blaine at TED discussing his stunts, focusing on his world record breath hold. SOWETO - Blaine doing some card magic for some kids in South Africa. DRESSED FOR DINNER (GREAT WHITES) - Blaine free-diving with some Great White sharks wearing some different costumes. Some very cool photography here. Watch this with some friends and some conversation will definitely start up. ABOVE THE BELOW (44 DAYS) - An abridged version of the Above the Below special in which Blaine lived in a glass box hung over the River Thames for 44 days surviving on nothing but water. WORLD RECORD BREATH HOLD - A clip of Blaine beating the world record for breath holding on Oprah's show. I do wish he would have included the last two specials Discover Magic (unreleased footage from over the years) and Beautiful Struggle (documentary on his stunts) that both aired in late 2010, or some footage from his Revolution stunt or his Magic for Haiti charity performance of 72 hours of magic, but I'm sure some of those will show up on a later DVD set. The main features here are Blaine's top-billed TV specials, and as far as a magic performance DVD goes, these make up some of the best magic specials ever collected from TV. If you enjoy Blaine's work, this is something you'll want to add alongside his first DVD release, Fearless. Each special probably could have had its own DVD release, so to get all three along with the extra disc of some very cool bonus footage for just $19.99, it's a great buy. The casing is a beautiful fold-out with a slip cover. It's great to watch these specials in a high quality format and see all these again. As a magician and performance artist, Blaine has great artistic vision and execution, and as illustrated throughout these specials, he knows just how to translate his talent and vision through a televised medium.